Hope springs eternal this time of year if you're a baseball fan like me - and with this winter, everyone should be looking forward to baseball weather. 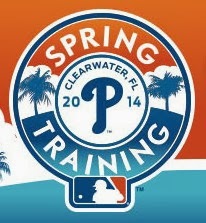 Phillies pitchers and catchers reported to camp this week for the start of Spring Training. If you're going to any of the games in Clearwater, read my updated post highlighting restaurants in the area. Gluten-free options at Bright House Field, where the Phillies play their home games in the Grapefruit League, include all-beef hot dogs and buns, grilled chicken and chips sold at the concession stands behind home plate and left field. Hard cider and Redbridge beer is available at Beers of the World. Closer to home, the dedicated gluten-free concession stand at Citizens Bank Park that debuted last year will return for the 2014 season and there will again be a Celiac Awareness Day game. This year, the game will be on Sun., May 18 against the Reds, the same date as the Phanatic's birthday; all fans 14 and under will receive Phillie Phanatic Phun Glasses. Stay tuned for ticket information for the gluten-free sections. L'Oceano Ristorante in Collingswood (833 Haddon Ave., 856-833-9888) can accommodate gluten-free orders and can serve risotto in lieu of pasta. Also in Bethlehem, TheMINT Gastropub (1223 W. Broad St., 610-419-3810) has a gluten-free mac & cheese option, gluten-free bread and a variety of hard ciders, while the Blue Sky Cafe (22 W. 4th St., 610-867-9390) has gluten-free rolls and tortillas. Reader Denise F. let me know of two suburban Philly options with gluten-free pizza: Warminster's Pizza Plaza (768 W. Street Rd., 215-957-0199) and Horsham Pizza (314 Horsham Rd., 215-442-9344). Both shops prepare the pies separately. In South Philadelphia's Bella Vista section, Down Dog Healing Cafe (1001 S. 10th St., 215-305-8201) has a selection of gluten-free options, including products from Taffet's Bakery, while The Random Tea Room & Curiosity Shop in Northern Liberties (713 N. 4th St., 267-639-2442) offers gluten-free baked goods. I reported earlier this week that Starbucks is introducing several new gluten-free food options, including a marshmallow rice crispy treat and a flourless chocolate cookie. Outlets with La Boulange pastries will be carrying these, and rumor has it that several more are on the way. 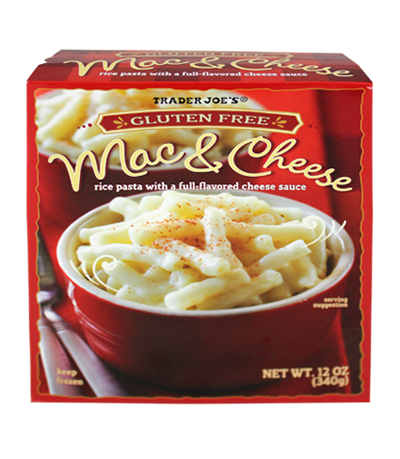 Trader Joe's has featured several gluten-free products in its February Fearless Flyer ad, including a new gluten-free heat-and-eat mac & cheese dish. It's made with rice pasta and Monterey Jack and cheddar cheeses and sells for $2.99. Also mentioned are TJ's cupcakes with buttercream frosting, rolled oats and all-purpose flour. While not listed on the gluten-free page, the market's new poutine (a Canadian specialty made with fries, cheese curds and gravy) has no gluten ingredients. The next meeting of the Chester County Gluten Intolerance Group will be on Tues., March 4. The guest speaker is health coach Jennifer Fugo. The meeting begins at 6:30 p.m. and will be held in room 171 of the Chester County Government Services Center in West Chester (601 Westtown Rd.) Registration is not required for this event, which is free, but donations accepted to help defray costs. Have a happy Valentine's Day and a great weekend! The Gluten Free Philly app for iOS and Android devices is now available. Find more than 1,300 area gluten-free-friendly businesses on the go, search by cuisine or neighborhood, make reservations and more!